Hi all, what do you guys think this is? It is lime green with a streak of what looks like quartz. Chrysocolla? Chrysoprase? thanks for the help. Refractive Index: 1.61 to 1.81. My vote is for Lemon Chrysoprase. You might find better photos to help decide if this is it... .
Gemfeller is right. The other name it goes by it Citron Chrysoprase. I like the Citron/Lemon material better when it comes to cutting. The Citron material has been getting much harder to find and I like the distinctive color it has. It cuts great and goes well with other stones. Re: Slab Identification Help - Lemon Chrysoprase? Sure glad this post came up! I've just been working a slab of this material, it was sold to me as gaspeite several years ago. I have a customer waiting on earrings from it now. So, Lemon Chrysoprase? Gaspeite is A bright Lime Green and often has tan or brown areas associated in it. Another way to tell is often the Citron Chrysoprase will have small black dendrites and Gaspeite I have never seen with any dendrites. The Chrysoprase for a better description often has almost like a meringue pie sort of color - more muted and almost a pastel. Gaspeite is A bright Lime Green and often has tan or brown areas associated in it. Another way to tell is often the Citron Chrysoprase will have small black dendrites and Gaspeite I never never seen with any dendrites. The Chrysoprase for a better description often has almost like a meringue pie sort of color - more muted and almost a pastel. The original post described the slab as "lime green," not citron/lemon-yellow. I took the poster's word and that's why I ventured the Gaspeite ID even though I mentioned the image appeared rather yellow. So-called "Lemon/Citron Chrysoprase" is silicated magnesite, not true green nickel-colored chalcedony. 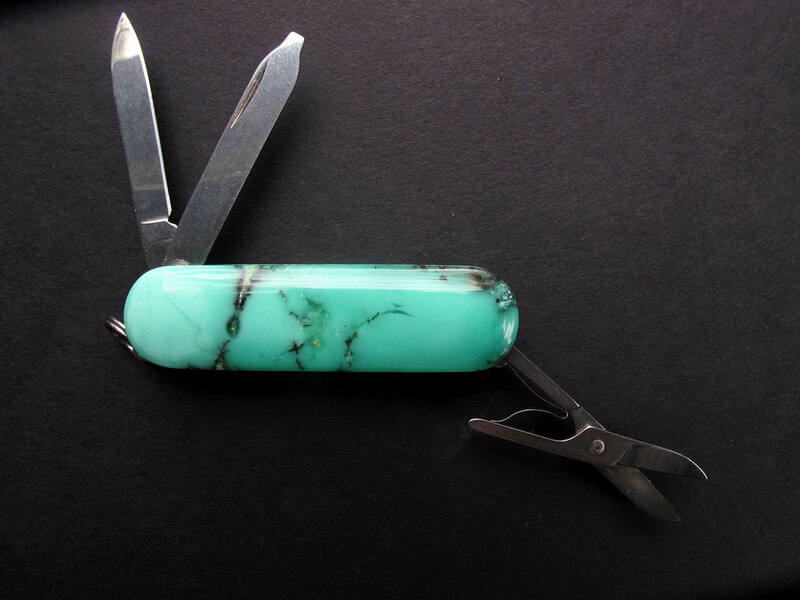 It's marketing hype because it occurs with genuine chrysoprase even though it's an entirely different mineral. I posted this image sometime back to illustrate that point but feel it's appropriate to post it again. 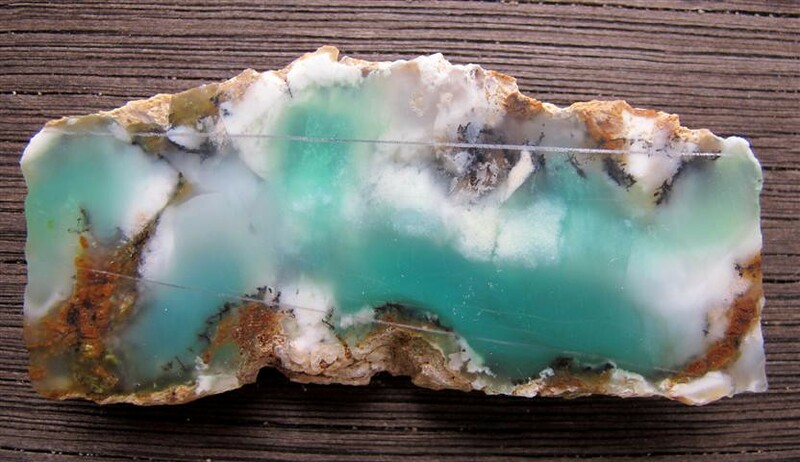 It shows an unaltered spot of yellowish magnesite inside a slab of true chrysoprase. That's a cool slab photo Gemfeller. I saw it when searching for an ID link to post earlier in the thread. That slab would be in one of our "keeper" drawers just because the magnesite is completely surrounded by the chrysoprase. Wow thank you all and Womanwithatorch what u have pictured is exactly the way my small slab looks. I just made a great pendant of it. I will post a pic tomorrow. Love working with this stuff. I would also describe my stones as lime green, not yellow. In the photo, they look more blue-ish. My stones do not have any black dendrites, do have some brown areas. Also present are veins of translucent blue-green, harder than the lime green, causing some undercutting in cabbing. Yup citron or lemon chrysoprase. It is magnesite that has been saturated with silica, the colour coming form nickel. 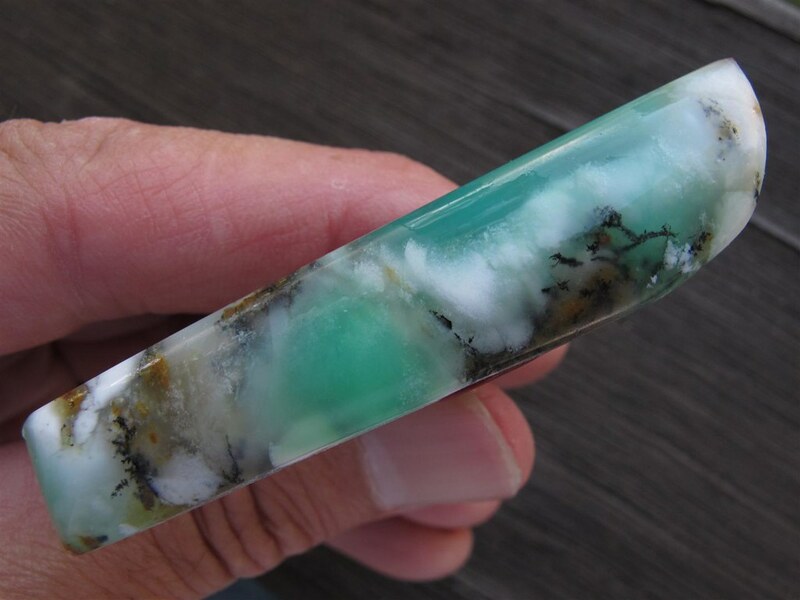 It can grade from chalky (mostly magnesite) to pure chrysoprase and often grades between the two in a single piece (the outback mining photo being a extreme example of the graduation). The colour can range from yellow - green - blue green. The cuttability depends on how silicified the magnesite is, if the silica content is low it is chalky muck and useless. Wow. I think the scale on the dop is the nicest piece of "included" chrysoprase I've ever seen. Your scale there has changed the way I've always looked at (and for) chrysoprase. Always tried to get the cleanest translucent rough with good consistent color saturation, avoiding anything with other characteristics. Now I'll also be hoping I can find some that looks like your piece. Thanks for posting it.